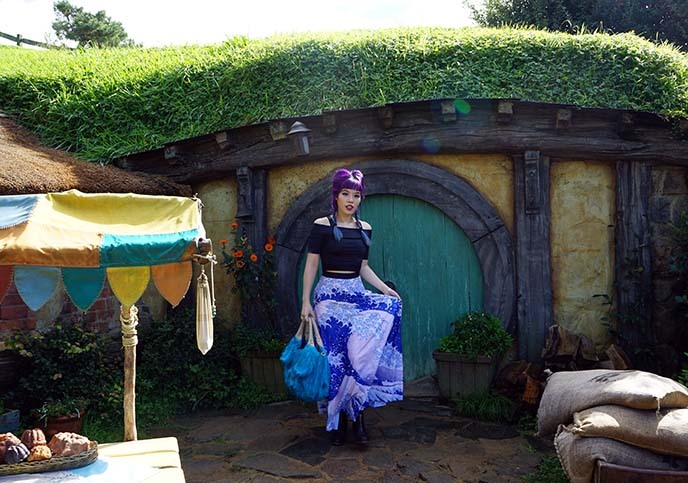 Visiting Hobbiton, New Zealand’s Hobbit set! The Shire location, Lord of the Rings movie tour. 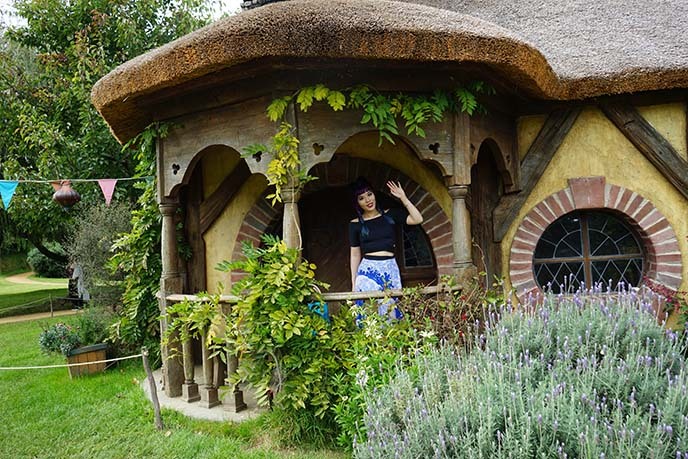 If I had to pick the highlight of my Contiki New Zealand adventure… it would be my tour of Hobbiton, the Lord of the Rings and Hobbit movie set! 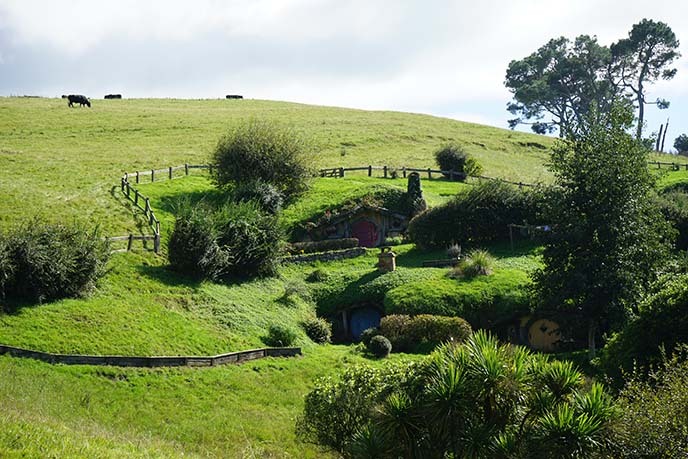 LOTR director Peter Jackson personally scouted this spot for his films, and had his team build a Hobbit village from scratch. 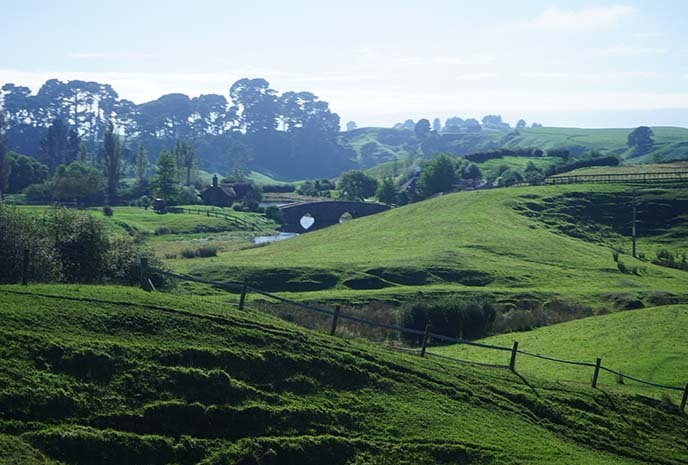 These Shire scenes are some of his most memorable, and put New Zealand’s idyllic landscapes on the map. 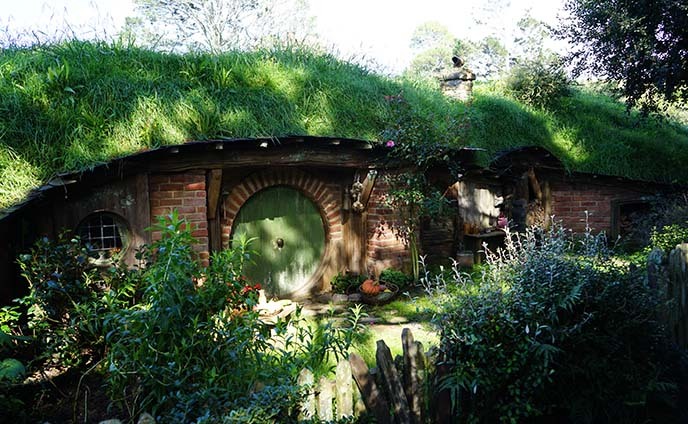 The “Hobbit holes” were too cute to tear down, so Peter Jackson agreed to preserve them as an attraction. 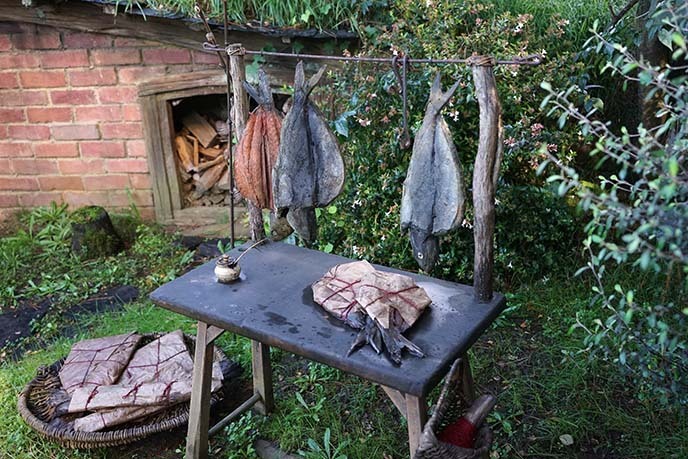 Today, fans from around the world come to frolic in the footsteps of Frodo, Bilbo and Gandalf. 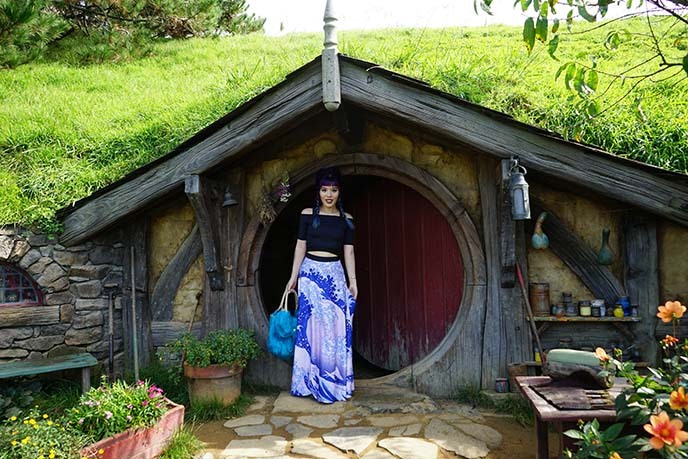 As you can see from these photos, it felt like I had stepped right into Middle Earth! 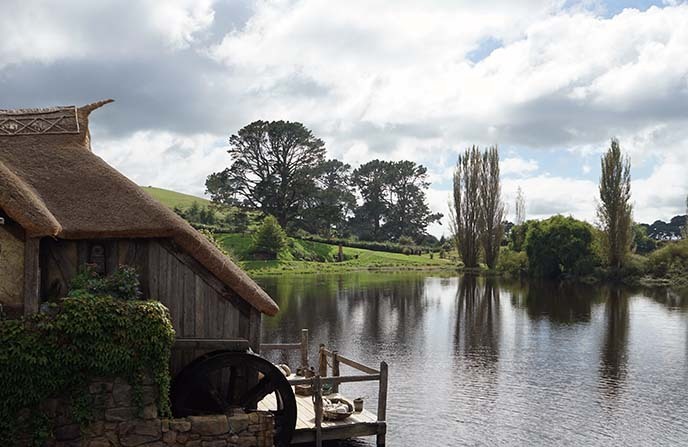 Read on for the scoop on how to visit Hobbiton, and photos of the famous set locations — including the Green Dragon Pub, Mill, and double-arched bridge. In the 2000s, director Peter Jackson released three Lord of the Rings movies, followed by the Hobbit trilogy. The films were box-office successes and generally loved by fans. All of the outdoor scenes in the Shire (home of the Hobbits) were filmed right where I’m standing. I’ve written before about the ease of travelling with Contiki, a travel company for 18-35 year olds. Our tour manager Monique gave us info on the best activities in the North Island, including Hobbiton. If we wanted to book, she did all the arrangements for us, including drop-offs and passes! Contiki’s prices are also lower than if you reserved the same tour on your own. (Close-up of my Alex Streeter Gothic rings, and nail art by Glam Nail Studio). Most visitors come in from Rotorua, the Maori hot springs town about three hours south of Auckland. 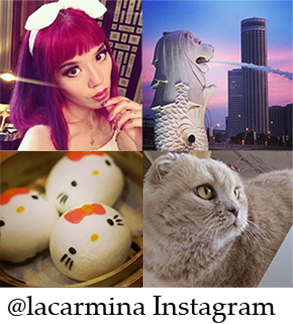 (We spent time here with Contiki; I’ll show you more in the next post). The Hobbiton bus picked us up from our Rotorua hotel, and we enjoyed an hour-long drive through bucolic farms and the Kaimai Ranges. 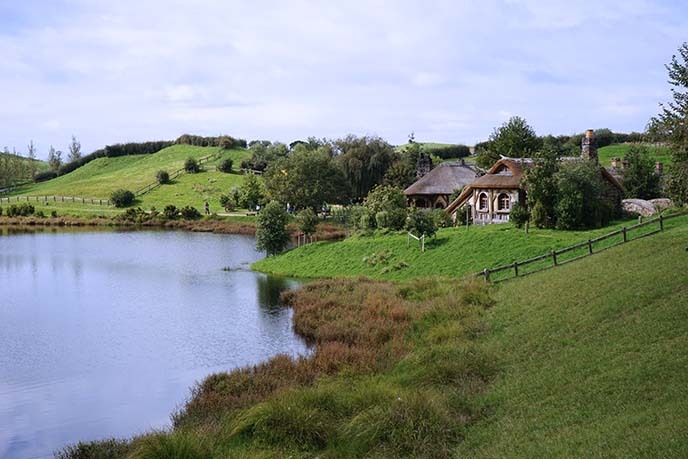 If you want to drive here on your own, Hobbiton is located in Hinuera, Matamata. Note that you can’t visit the adorable set unless you join the official tour, so book early as the spots fill up quickly. We met our energetic guide, and she took us on a two-hour tour of the twelve acre site. 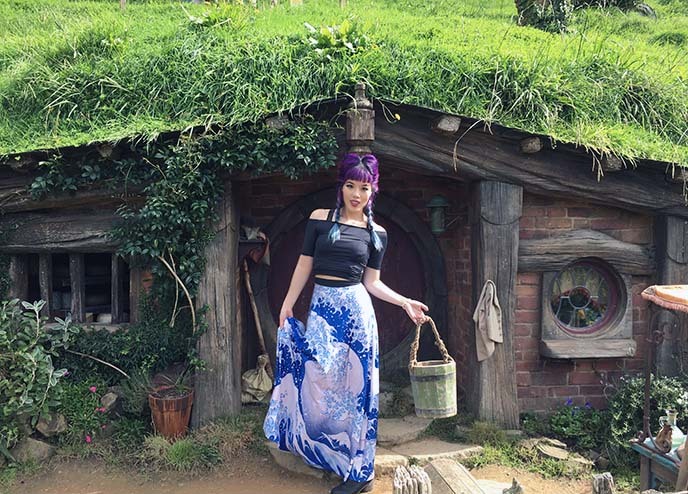 She told us juicy behind-the-scenes tales, and led us to every area of the Shire with lots of time to take photos. I’ve been to some movie sets that feel like cheesy theme parks. Thankfully, Hobbiton is nothing of this sort. I walked through these gorgeous gardens, basking in the patches of sunlight and scent of flowers. The designers put remarkable thought into every aspect of the village, and never ruin the effect with modern incongruities or cash-grabs. 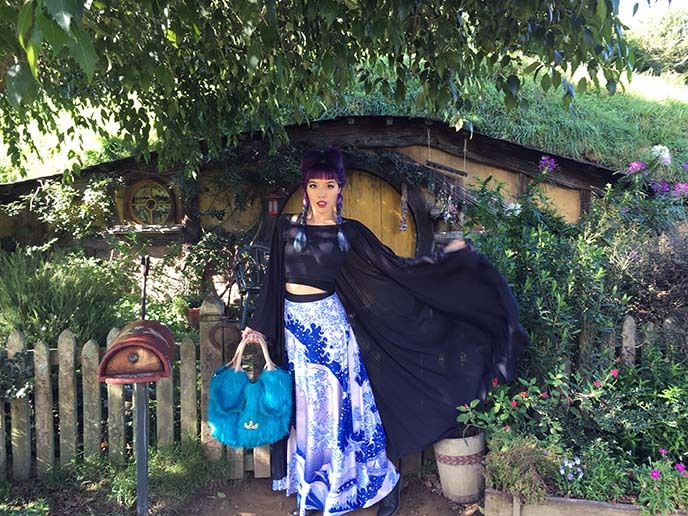 (I’d die if there were a souvenir vendor in front of the Baggins’ home!). 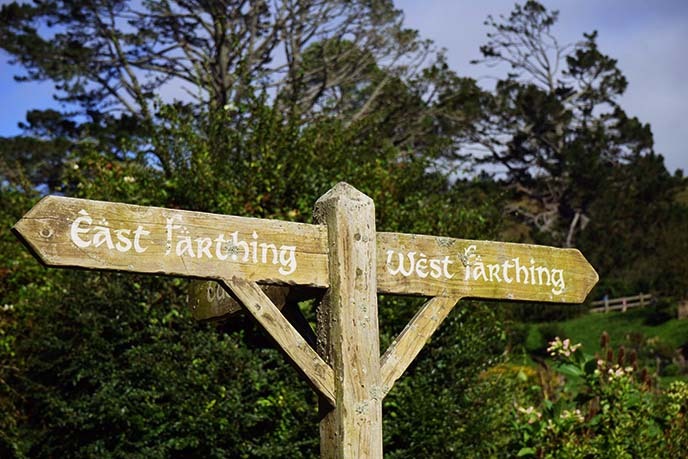 Tolkien fans will appreciate details like this signpost, which shows the “farthings” or subdivisions of the Shire. Some of the “Hobbit holes” have fences that prevent you from going into the yard, but you’re welcome to play with the props outside. Let me tell you… that wheelbarrow was heavy! Check out the clothesline hanging above the house. Hobbits are about the size of human children, and their garments are adorable. 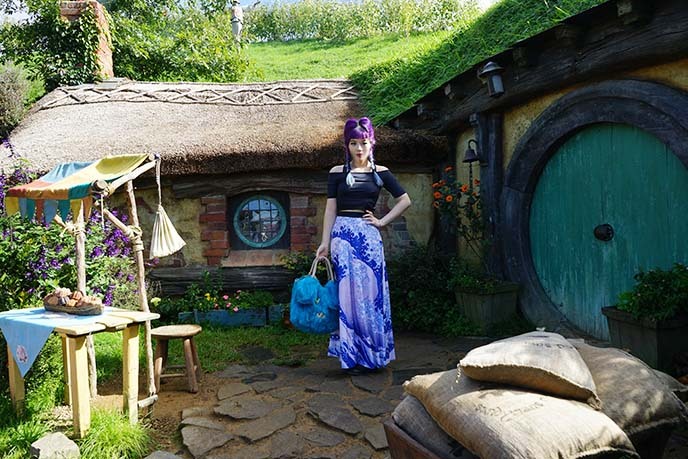 Hobbiton gives you a glimpse of daily life in the shire. Next to a pumpkin patch, there was a rack of (fake) dried fish. How did this paradise come into being? 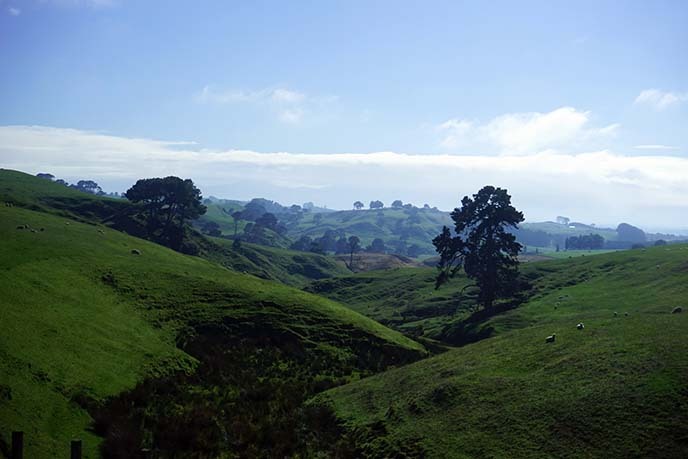 Our guide told us that director Peter Jackson spotted this slice of New Zealand countryside from the air, as he searched the North Island for shooting locations. He immediately knew that Alexander Farm (as it was known) was perfect for Lord of the Rings. Peter Jackson took up temporary residence in a nearby farmhouse, and oversaw the massive set transformation. 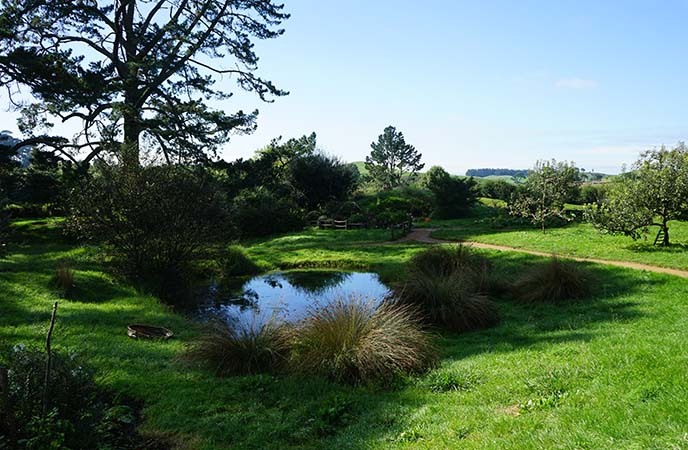 His team of builders turned the bare Waikato farmland into a real-life version of Tolkien’s Shire. The houses look outstanding in the films because everything was built at the highest standards. The wood, plants and glass are all the real deal. 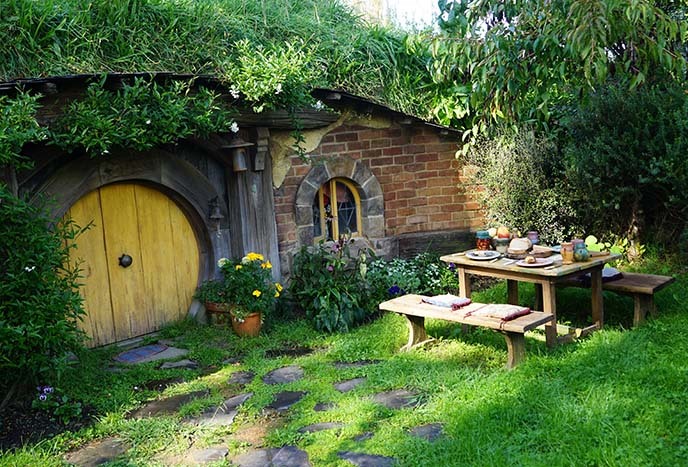 But here’s something you might not know… Almost all of the Hobbit holes are only exteriors! There’s nothing behind the round doors, as the indoor scenes were filmed in a Wellington studio. Our guide pointed out where key scenes in LOTR were shot. She showed us the pond, and the fence that Frodo Baggins jumped over in The Fellowship of the Ring. 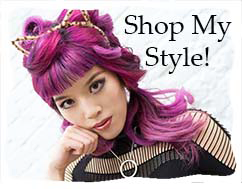 Outfit details: My “Great Wave” skirt from Black Milk Clothing is currently my favorite item in my wardrobe. The floaty material and Hokusai print are a stand-out. 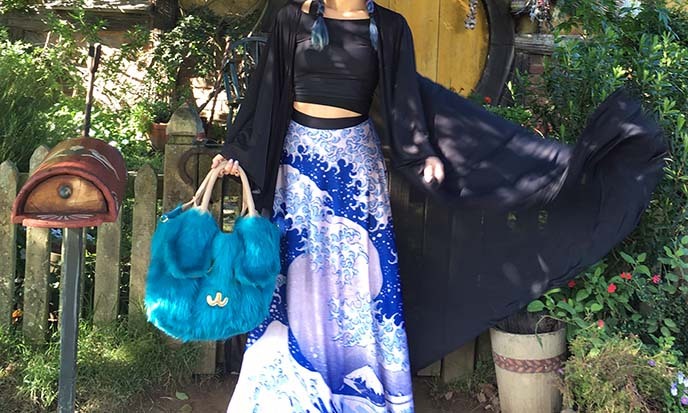 Everyone in Lord of the Rings seems to wear a cloak, so I paired it with a black cape (similar) and matching blue purse. I gained a new appreciation for Peter Jackson’s movies during the Hobbiton set tour. Our guide told us stories of the hard work that went into the making of LOTR. 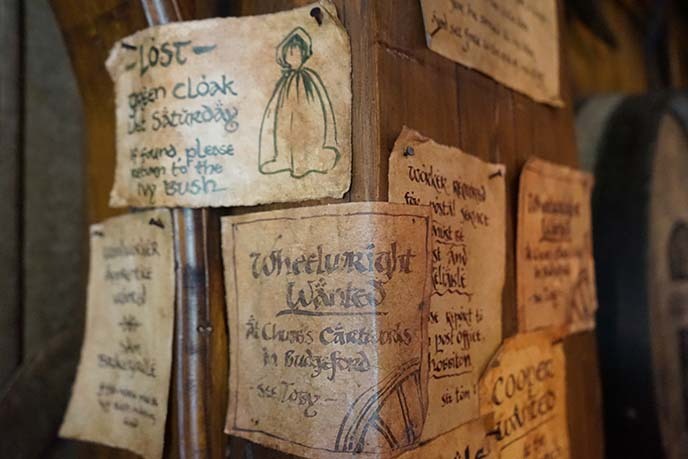 For example, the oak tree overlooking Bag End is actually a stump, which was hand-decorated with thousands of artificial leaves! The film crew built about 40 Hobbit holes for the Shire scenes. I learned how they used tricks in perspective to make Gandalf (played by Sir Ian McKellen) seem much taller than Frodo (Elijah Wood) and his fellow Hobbits. 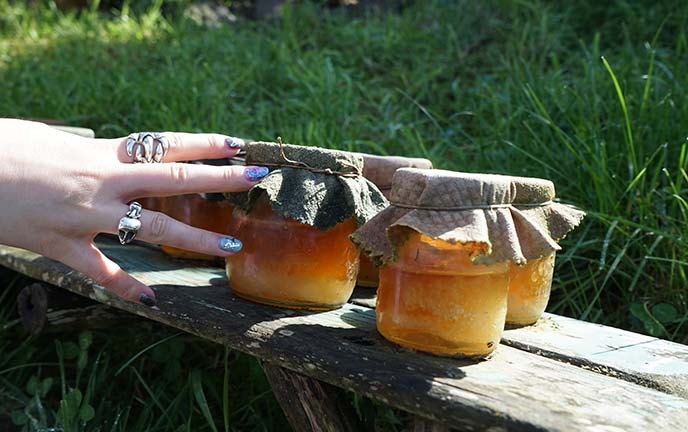 Close-up on my Alex Streeter claw and skull rings, and realistic-looking prop pots of honey. As I previously mentioned, most of the indoor and special effects scenes were shot in Wellington. 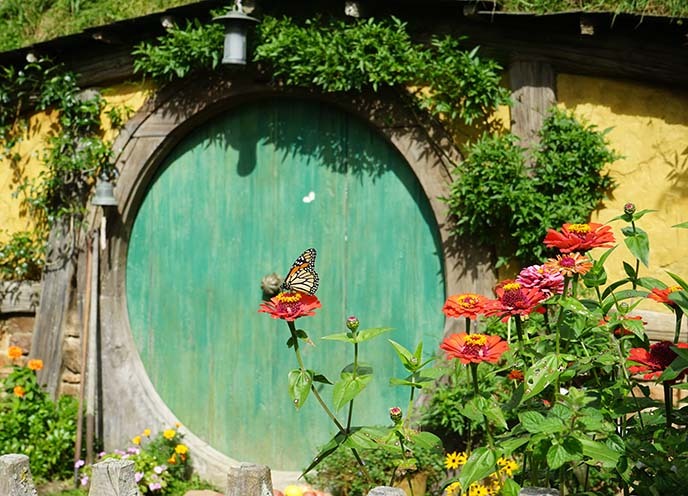 If you come to NZ’s capital city, don’t miss out on the Wellington Lord of the Rings Movie tour. No special effects needed, to bring out the beauty of New Zealand’s fields. The cows and sheep are also the real deal. Quite a few fans dress up in Lord of the Rings costumes, for the Hobbiton tour. While I didn’t do a full cosplay, I paid tribute to Middle Earth by wearing a dramatic cloak. 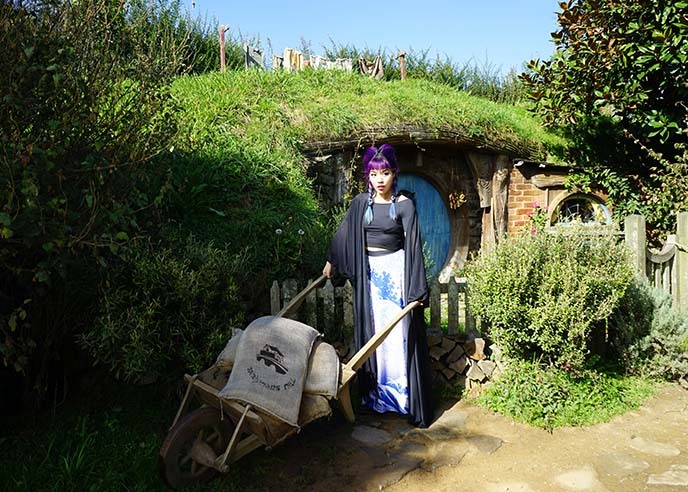 You can’t take the fake pastries home with you… but there’s a gift shop at the entrance, called the “Shire Store.” Inside, you can purchase a wide range of products like posters, action figures, and Gandalf’s wizard hat. 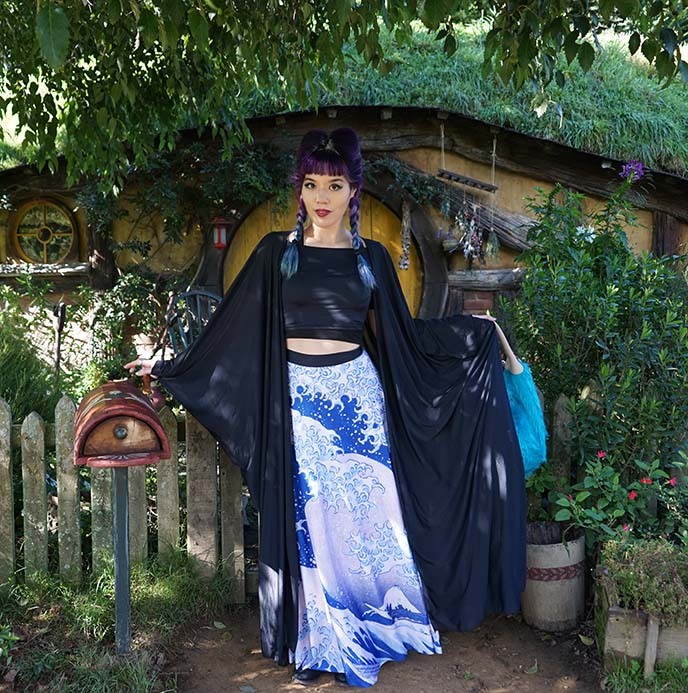 One of the most charming natural features of Hobbiton: there were butterflies everywhere! I saw white and colored wings fluttering over the flower gardens, and managed to take this photo of one drinking nectar. Tip: bring both sunscreen and a light jacket, since the weather can change quickly. 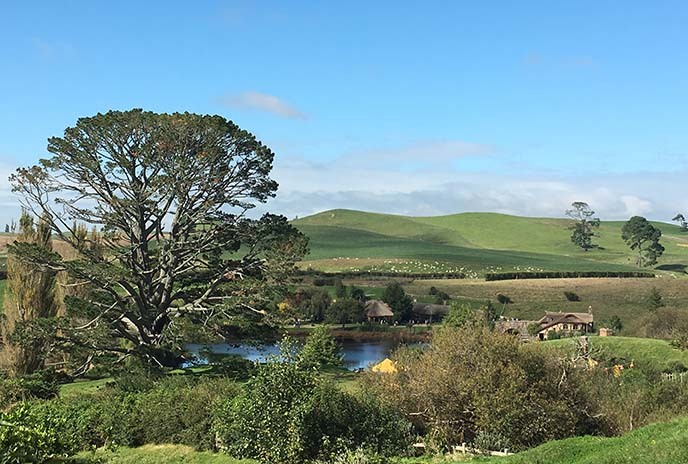 I encourage you to check the weather forecast on the day you’re visiting Hobbiton (and remember, it’s advisable to book your tour slot and bus ride well in advance). 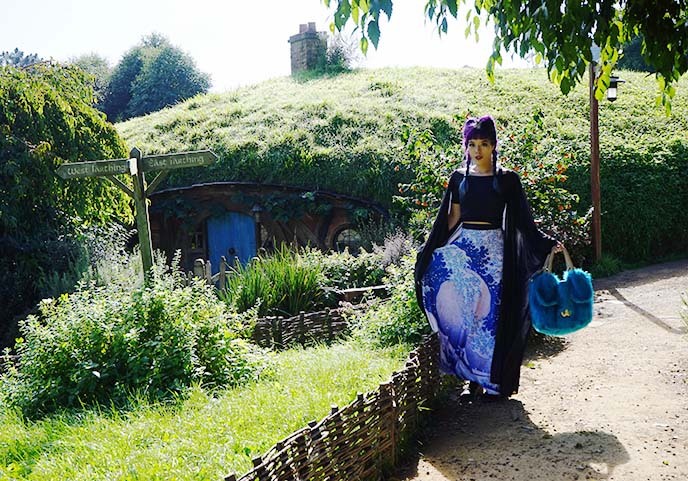 I think author JRR Tolkien would be thrilled about how Hobbiton brought his world to life. We crossed the stone bridge and passed the Mill House, on the way to the Green Dragon Inn. 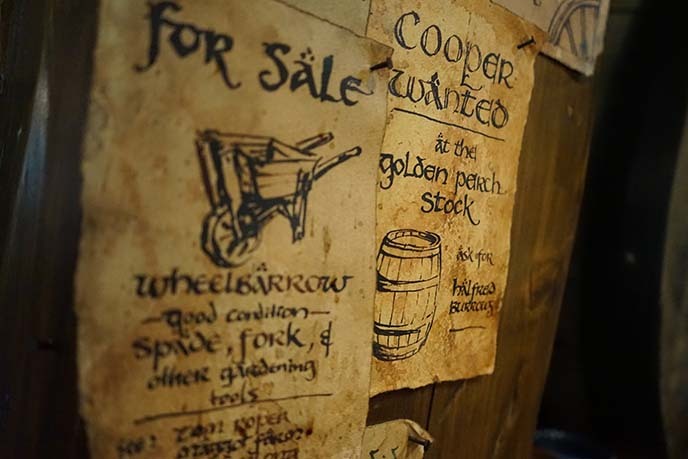 Hobbiton produces their own Southfarthing range of ales, ciders and ginger beers. This giant barrel was near the May Pole and party field. At River Churn, we passed The Old Mill that was owned and run by the Sandyman Family, according to the fantasy novels. 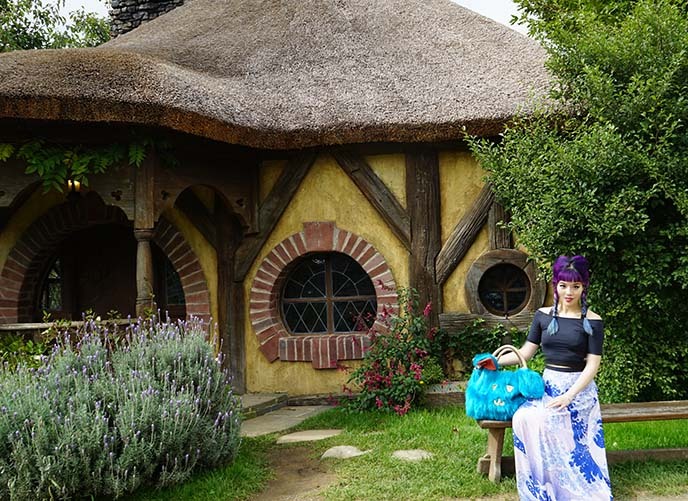 Hobbiton does a wonderful job at creating an authentic setting for fans. There’s also a limited number of spots per tour, so the set doesn’t feel overly crowded with tourists. 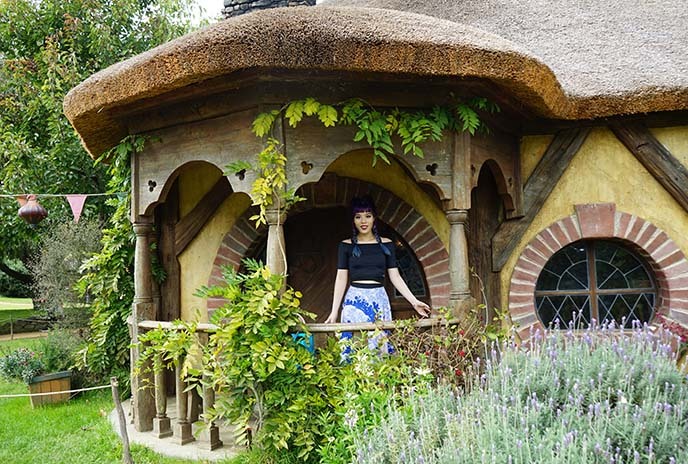 The homes feel so real that I half expected Hobbits to pop out behind me! 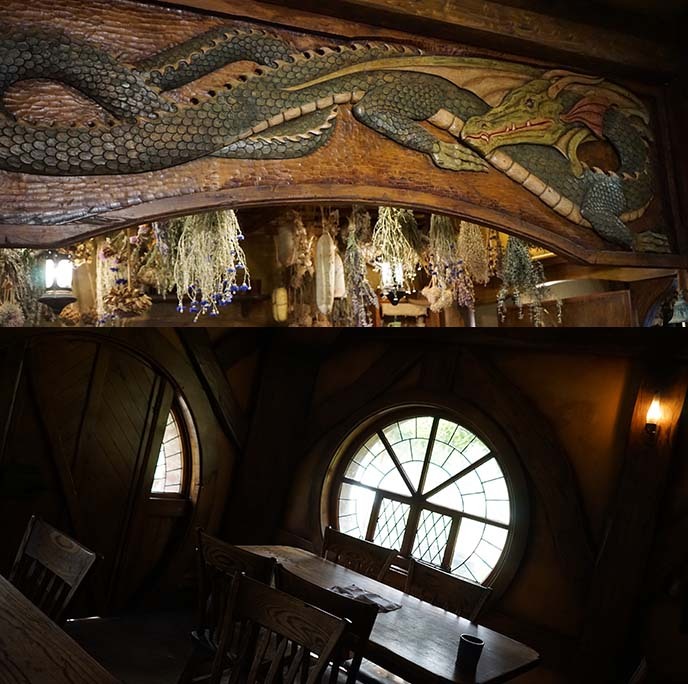 At the end of the tour, we headed inside the The Green Dragon Inn. This is the bar and meeting-place for the locals, as featured in the Lord of the Rings and Hobbit movies. 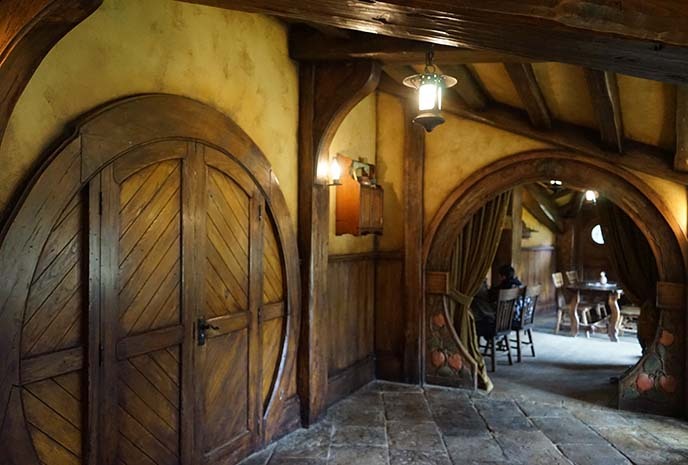 The scenes inside the inn were actually shot in the Wellington studios, but Hobbiton faithfully recreated the pub for fans to visit. Everyone got a free Southfarthing beverage (ale, cider or ginger beer) and could order country fare at the counter (cheese scones, meat pies and more). From the dragon decor to the round windows, this is a perfect reproduction. What more is there to say? Hobbiton captured my imagination, and was one of the best moments on my New Zealand journey. 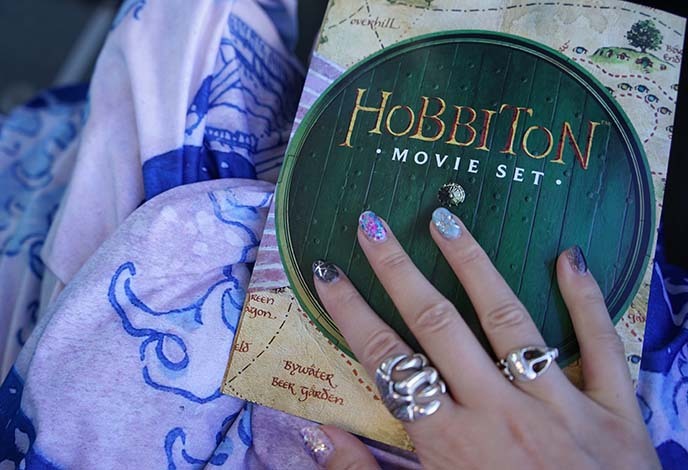 I hope this post inspires you to watch the Hobbit movies, and read J. R. R. Tolkien’s marvellous books: Lord of the Rings Trilogy and The Hobbit. 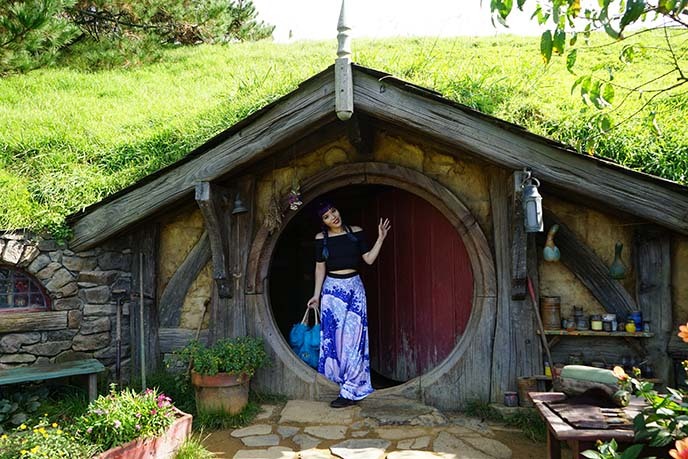 So grateful to Contiki for sending me to Hobbiton. I thoroughly enjoyed travelling with Contiki (on a bus with other millennials) on their Sun and Steam New Zealand trip. 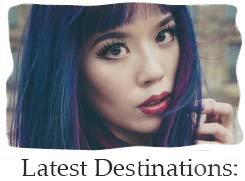 Be sure to check them out; they offer tours to destinations around the world. Are you a LOTR fan? Have you heard of this Hobbit heaven before? It was a great place for photography. Such a great place for fans. Yes so happy I went. A reminder of how LOTR was a brilliant film, thank you. This made me want to re-watch the movies! Alex Rings in HobbitLand ! Loved every moment I had had over there. Went here a month ago, WAS FANTASTIC! I’ve been there too! So much fun!